lost photos, evaluate recovery quality before they buy, and get back the photos they really want. - Recover not only photos, but also videos and music files; - Deep scan-Recover photos that even overwritten or cannot be recovered by other recovery tools to get complete photo recovery. 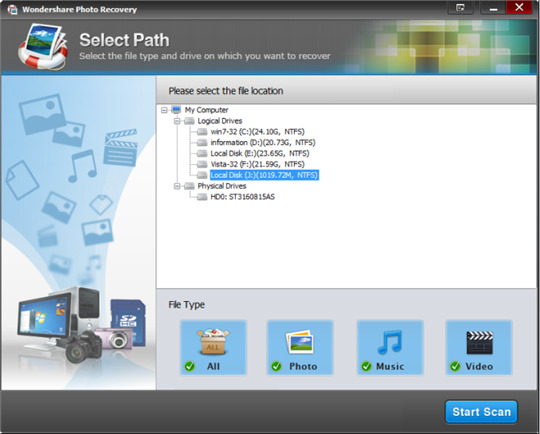 - Various devices supported-Recover deleted photos from PC, USB drive, digital camera and other storage media. - Overall data loss scenarios supported- Recover photos lost due to accidental deleting, formatting, improper device usage, virus attack, software crash, and other reasons. - Preview thumbnail lets you preview recoverable images before you buy. - Enjoy photo recovery and check recovery quality in advance. d. Automatic Classification classified automatically ccording to formats to save you much time. e. Easy-to-use Recover photos within only 3 simple steps, just as easy as counting 1-2-3. No any recovery skills needed.